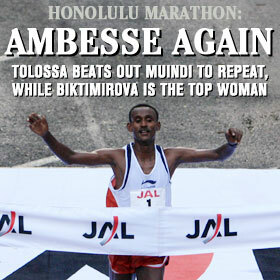 Ambesse Tolossa of Ethiopia won his second straight Honolulu Marathon yesterday, finishing in 2:17:26. A big-time Hawaiian blessing -- rain -- welcomed the 27,892 runners, turning the turf around the finish line into a sea of mud. Two miles high, rescue teams will search again today for a Michigan man last seen just before a blizzard hit. A UH scientist aims at improving understanding of how major earthquakes trigger powerful tsunamis. In a single day, 200 people converted a gnarly jungle of hau trees and thick undergrowth to a working taro patch. Ogasawara has been making dolls since the 1940s and her tapa-cloth creations have been sold at Bishop Museum, Liberty House and Sears. Ethiopia's Tolossa beats out Kenya's Muindi to repeat, while Russia's Biktimirova is the top woman. Hawaii took full advantage of Long Beach State's mistakes to build a controlling lead. Maria Louisa Almasy is studying to be a nurse while working as a medical receptionist. The "Superbad" movie packages, including a fake state license, are being sold by Wal-Mart.